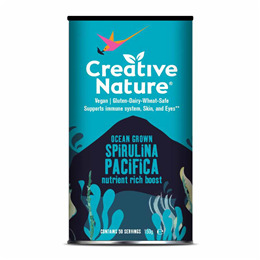 One of the most beautiful superfoods - Creative Nature Spirulina Powder has become a popular purchase for many food and health lovers! Spirulina is a blue-green algae that is ground up to produce this beautiful powder and can easily be used to boost the nutritional value of smoothies, juices, shakes or even some raw/vegan desserts! It can even be used as part of a home-made facemask if you’re looking for something to boost your skin’s healthy appearance and keep it glowing. Sprinkle over salad or use in salad dressing; With fruit juice or in smoothies; Raw home cooking such as spirulina-cacao truffles; As a shot, with water (If you are brave enough). Store in a cool, dark place, out of direct sunlight. Pop the airtight lid back on to help preserve freshness. Product packed in a factory that handles nuts. Do not exceed the stated amount. 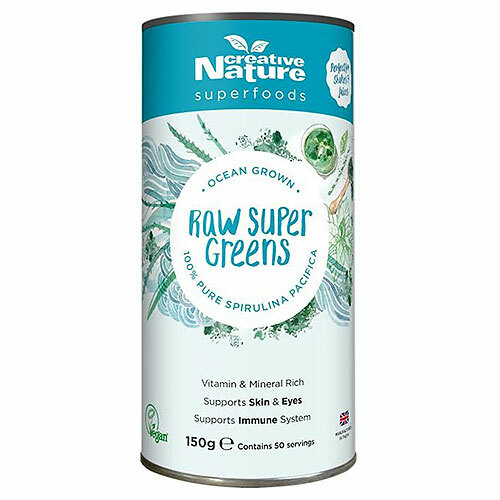 Below are reviews of Creative Nature Raw Super Greens - Spirulina Powder - 150g by bodykind customers. If you have tried this product we'd love to hear what you think so please leave a review.